Help! I’m having some trouble! Let’s try to fix it! First, is your app up-to-date? Most of the time, problems are easily fixed by simply updating the app. Don’t know what version of the app you are using? Continue reading! To see what version of the app you are using, go to the “Home Screen”. In the top left-hand corner, tap the “i” to open information. At the bottom of the screen under “Credits” you will see the version number. For optimum performance, be sure this matches the latest version in the app store. To create a Triposo account, install the Triposo app and open the app on your device. On the home screen you will see an empty photo box and the text “You are not signed in” below it. To create a new account tap the photo, on the next page, tap the “Register” button. Enter your information or connect with Facebook. To login to your account, open the app. On the home screen you will see an empty photo box and the text “You are not signed in” below it. To sign in, simply click the photo and tap the “Sign in” button on the next screen. You can sign in with your email address or with Facebook. Do I have to have Facebook to use Triposo? OR I don’t have a Facebook account. OR I don’t want to use Facebook to login with Triposo. What can I do? We know not everyone has Facebook or wants to authorize Triposo to access their Facebook account. Instead of using Facebook, you can login through our user-authenticated registration process. All you need is an email address. We’re sad to see you go! To delete your account please send an email to [email protected] and we’ll take care of the rest. How can I set my unit preferences? For example, how do I switch from kilometers to miles, EUR to USD, or Fahrenheit to Celsius? To change your unit preferences you must be logged in. From there, follow these steps. Once you are logged in, go to the home page and tap your photo to open your account. Scroll down to “Preferences”. Choose the preferences you would like to change. What is Triposo Pro and how do I get it? With Triposo Pro you get the ultimate Triposo experience. Triposo Pro is the ad-free version of our app. We created this so you can travel without any distractions. To upgrade to Triposo Pro, go to the home screen, tap your photo to open your account page, and tap the “Get Triposo Pro” button. How do I sync my account to my other devices and the Triposo website? To sync your account, you must be logged in. Go to the home screen and tap your photo. This will open your account page. At the top of the screen you should see a “Sync” button. Tap the button to sync your account. Why should I sync my account? The advantage of syncing your account is that you can view your saved places, saved dates, saved guides and city walks on all your devices and on our webiste. How do I save or un-save a place? To save a place, open the place and tap the star icon with the word “Save” beneath it. If the place is already saved, the star icon will be filled in and the text will read “Saved”. To un-save a place, tap the same star icon you tapped to save it. Do I have to be logged in to save a place? No, but if you are not logged in, the saved places will only be visible on your current device. Where can I see all my saved places? To see your saved places, Tap the “star list” icon in the top right-hand corner. A list of all your saved places will be displayed. How do I add dates to my trip? Adding dates is simple! From the destination page, tap the calendar icon. This will open a calendar where you can add a start and end date. Once both dates have been selected, you will be redirected to the destination page and the dates you chose will be displayed below the calendar icon. To change or update the dates, tap the calendar icon again and choose new dates. A city walk is a great way to explore a new city! We take a list of top-rated places and attractions in the area and organize them in a way that makes sense. In top cities, you will find a list of city walks at the bottom of the “See & Do” section. City walks are designed around a neighborhood or theme. They are an excellent introduction to the city and an easy way to discover new things without getting lost. If you prefer to create your own city walk with a customized list of places, keep reading! How do I create my own city walk? Create a city walk from your saved places: From the destination page, tap the star list icon in the top right-hand corner of the screen. This will bring you to your Saved Places page. From there tap the “Create City Walk” button. Select the places you want to include in your walk and tap create. Name your walk, edit what you like and save it by tapping “Save” in the top right-hand corner. Create a city walk from the city walks page: From the City Walks page, tap the “Create City Walk” button. This will bring you to “My City Walk”. You can change the name, adjust the length, share it or keep it private, and add or delete places. Save the walk by tapping “Save” in the top right-hand corner. How do I find my saved city walks? If you created your own city walk or saved a pre-made city walk, you can find it in your saved places. What is a mini guide? A mini guide is a local guide centered around a theme or neighborhood. Mini guides can be written about anything: One day in Amsterdam, the best coffee shops in Istanbul, or even an introduction to Williamsburg, Brooklyn. 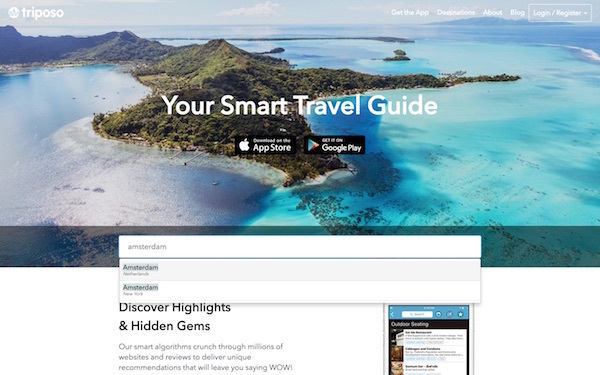 You can create a mini guide on your own at http://triposo.com/layer/new or read mini guides created by Triposo and travelers like you. Does your app work offline? Can I use your app without WiFi? Yes! Most of the Triposo features are designed to work offline when there is no WiFi or mobile data connection. After you install the app, download the guides you want to use offline while you are connected to the internet. Once the guides are downloaded, you will have access to them anywhere you go. Offline guides include all the information you would have online. Continue reading to find out how to download a guide for offline use. To download a guide you must be connected to the internet and your device requires adequate storage space. From the home screen, type in the destination you would like to download in the search bar. Once the destination pops up in the results, you will see a small download button in the right-hand corner of the description. Tap the download button to open the “Download Guide” page and choose the portion of the guide you would like to download. Alternatively, you can download a guide directly from the Destination page. In the center of the screen there is a “Download” button. Tap the button and wait until the cloud is filled in with a check mark and the text changes to “Downloaded” before closing the app. Why can’t I download a guide? To download a guide for offline use you need to be connected to WiFi or have data. If the WiFi or data connection is weak, the download process may be delayed or fail. If you are connected to the internet but are still unable to download a guide, your device may not have enough storage space. If the download process appears to be stalled, tap cancel, manually close the app, reopen the app and tap download again to resume the process. How can I delete a guide? There are two ways to delete a guide. From the Destination Page: Open the destination and look for the “Downloaded text and filled-in cloud icon at the center of the screen. Tap the cloud. A pop up box will ask if you would like to remove offline data. If the answer is yes, tap “Delete”. From the Home Page: Tap the search bar. Immediately all your downloaded guides will appear at the top of the results list. Tap the “X” icon in the right-hand corner of the respective guide and choose “Yes” to remove offline access. How can I delete a recent guide in the world app? There is no way to delete recent destinations. These are simply guides you recently opened and will be displayed at the top of your result list for convenient access. Once you start searching other destinations, these will change. If for some reason you would like to clear your history, you can delete and reinstall the app. Be sure you are logged in so that you do not lose all your saved places. My guide is missing - where did it go? Occasionally, guides are deleted due to lack of space. Sometimes this occurs when you update the app. If a guide goes missing, clear up some space on your device and download the guide again. Are the Triposo apps available in other languages? Right now, Triposo is only available in English. How can I add a restaurant, sight or attraction to your app? We love getting help from our community. If you find we are missing something or discover an incredible place you would like to add to our app, go to our website (www.triposo.com) and login with your free Triposo account or Facebook account. From there, follow these steps. 1. Type the destination into the search bar. 2. Scroll down the page and look beneath the map on the right-hand side of the screen. 3. Click the “Add Place” button. 4. Fill in the form with as much information as you can. 5. At the bottom of the form click “Save”. 6. Your submission will be reviewed by our team as quickly as possible and if accepted will appear in the app. This process may take several months so please be patient. 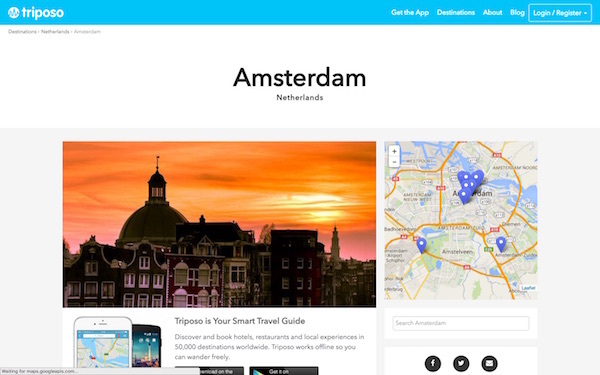 How can I add a hotel or hostel to your app? Triposo hotel bookings are powered by www.booking.com. This partnership enables Triposo users to book a place to stay directly through the app. If you would like to add a hotel to our app, it is best to contact Booking.com directly. I want to add something private, like where my car is parked or where I’m staying, but I don’t want everyone to see it. Where can I do that? 1. Open the destination you would like to add a place to. 3. Find the spot where you would like to add a place and long tap until a “Create a new place” message appears. 4. Tap “tapped location” to create a new place at the tapped location. You will see a star icon appear at the new spot on the map. 5. To change the name of the new place, tap the star icon on the map. You will be redirected to a description page where you can get directions, delete the place, edit the name, or write a review. How do I add a festival or event? First, check whether the festival or event has a Wikipedia page, if not, add one. Then, be sure the festival or event infobox is one of these types: music festival, film festival, holiday, recurring event. As an example, try editing the Queen’s Day festival in Amsterdam. After you make your changes, they will not be immediately reflected in our app. It could take several months for these changes to appear in our guides. I am having problems booking a hotel through your app. Triposo hotel bookings are powered by booking.com. If the booking process is giving you problems, you can try to book here. I can’t find my booking confirmation email OR I never received a confirmation email from the hotel. What do I do? The best way to solve any problem is to contact www.booking.com directly. If you have not received your confirmation email, check your spam folder first. If you lost your confirmation email or have any other questions regarding your booking, you can contact booking through the link below or give them a call. I have a question about a tour OR I booked a tour through your app but I never received a confirmation email. What do I do? If you haven’t received your booking confirmation via email, please check your Spam folder first. If you have checked your Spam folder and the email is not there, it is best to contact the tour company directly. We gather our information from open sources like Wikipedia, WikiVoyage, Facebook and OpenStreetMaps. There is inaccurate information in your app. If you think a piece of information is incorrect or outdated, the best thing to do is find the original source. Since we use open source data like Wikipedia, WikiVoyage and Facebook, it is likely that the information from this source is the culprit. Once the source is updated, the correction will be reflected in our app. My photo and my text are not credited properly. If you think we have appropriated copyrighted material please contact us at [email protected] and we will look into the situation and take further action as necessary. I have a company, can I advertise in your app? I don’t understand the GPS feature, how does it work? To locate where you are, the app uses the built-in GPS function on your device. The small white circle is you and the cone-shaped blue shadow is the direction you are looking in. The GPS feature does not require internet, so there should be no fees associated with using our maps. If you are looking at a map but you are not in the same destination, the distance is calculated from the city center. What if there is no GPS connection? If you don’t have a GPS connection or you’ve turned yours off, the app will measure from the next closest city. How do I download a guide to an external SD card on Android? By default the app should download the guides to the SD card. A limited set of Android devices fail to report the correct path to the SD card and the downloaded guides end up on the internal storage which fills up quickly. To work around this, you can go to the list of guides, tap menu, tap “Set download path” and specify the correct path to the SD card, without any extra subdirectories. It's best to do this after a fresh install.